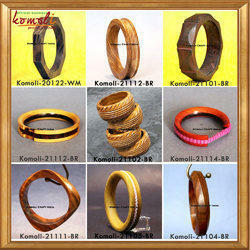 Our product range includes a wide range of handmade jewellery resin bangle bracelet cuff, bamboo design carved handmade vintage design bakelite bangle bracelet jewelry, vintage design carved resin acrylic bangle bracelet handmade jewelry, wide carved resin vintage design bangles bracelets, brass designer bangles bracelets - inter-locked chains and multi layered multi color - resin bangle bracelets cuffs. 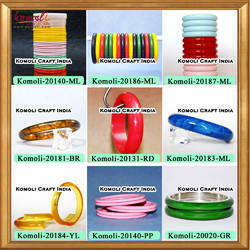 Komoli Craft India proudly presents endless variety & designs of Acrylic, Resin, Lucite Bangle, Bracelets, Cuffs, Earrings, Rings, Jewelry making beads etc of various sizes and patterns. These exotic handmade jewelry are perfect blend of Indian Pricing & International Standard of Quality and Services to our customers. We export these products to our patrons in United States of America, European Countries and Australia. Made from high quality Acrylic | Resin and these are indeed world class. 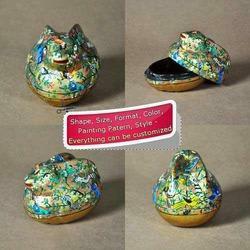 The colors used are non - toxic and a certificate of the same can be provided to you. 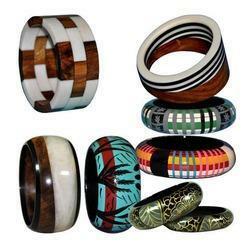 We offer Bracelets | Bangles and other jewelry variety of various Shapes, Size along with Hand Painted, wooden combination, Paper Insert, Fabric Insert, Digital printed jewelry products. We undertake OEM and Customization | Custom Designing Order and make products to suit your requirements and acceptance to your targeted customers. Please feel free to get in touch with us for your designs, style & fashion with your own choice of colors. Our Speciality is execute custom order of Acrylic | Resin | Lucite Jewelry. Please check out our other products to have a full view of our range of Resin | Acrylic Jewelry which includes solid color bracelet, layered bracelets bangles, fine multi-layered bracelets & bangles, Paper insert or Fabric insert laminated bracelets & bangles, smoky designs, chunky color products etc. The designs would always be having a contemporary look and matching with the current trends of fashion. 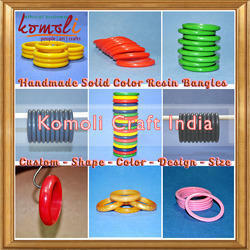 We at Komoli Craft India offer you world class comparable packing of these products as per your requirement. We do the branding and labelling services as well. 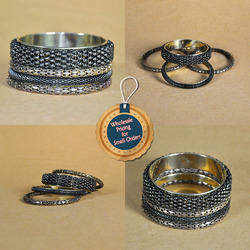 Packaging Details: 1 - Individual bangle in Poly Cover or Box as required. 2 - 12 Or 24 bangles in Master Bag | Box as required. 3 - Master Carton of 7 Ply at least. 4 - All Weather Shrink Wrapping of Master Carton. 5 - We can pack them as per your specifications & requirements as well. 6 - Bar-coding and Branding options are also available with small cost. 7 - Any other specific Packing requirement can be attended professionally. 8 - A variety of unique customized packaging options available at additional cost. 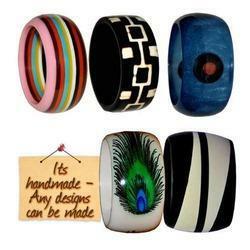 Handmade Resin Jewellery of Vintage design and fashion. Custom colors and custom sizes available. Made to order and designed to pleased. 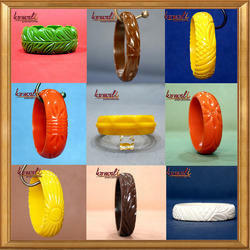 Wide and Thick carved resin bakelite look alike bracelet bangle of custom colors shapes and sizes. 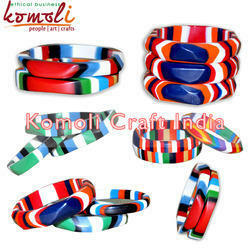 Komoli Craft India proudly presents endless variety & designs of Acrylic, Resin, Lucite Bangle | Bracelets | Cuffs | Earrings | Rings | Jewelry making beads etc of various sizes and patterns. These exotic handmade jewelry are perfect blend of Indian Pricing & International Standard of Quality and Services to our customers. We export these products to our patrons in United States of America, European Countries and Australia. Made from high quality Acrylic | Resin and these are indeed world class. The colors used are non - toxic and a certificate of the same can be provided to you. 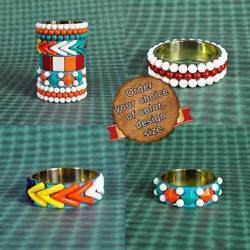 We offer Bracelets | Bangles and other jewelry variety of various Shapes, Size along with Hand Painted, wooden combination, Paper Insert, Fabric Insert, Digital printed jewelry products. We undertake OEM and Customization | Custom Designing Order and make products to suit your requirements and acceptance to your targeted customers. Please feel free to get in touch with us for your designs, style & fashion with your own choice of colors. Our Speciality is execute custom order of Acrylic | Resin | Lucite Jewelry. Please check out our other products to have a full view of our range of Resin | Acrylic Jewelry which includes solid color bracelet, layered bracelets bangles, fine multi-layered bracelets & bangles, Paper insert or Fabric insert laminated bracelets & bangles, smoky designs, chunky color products etc. The designs would alway be having a contemporary look and matching with the current trends of fashion. 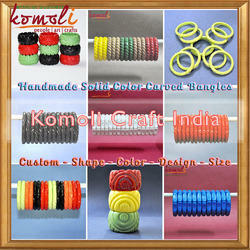 We at Komoli Craft India offer you world class comparable packing of these products as per your requirement. We do the branding and labelling services as well. 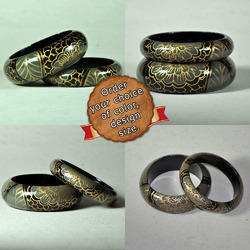 With our immense domain expertise, we are involved in offering Brass Designer Bangles. Known for its extensive appearance and unique patterns, these bangles are designed as per the set market norms by our experts using high quality material and ultramodern techniques. 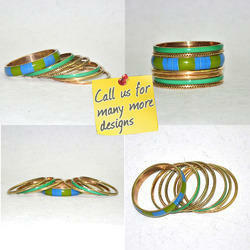 We offer our bangles in varied designs & finishes as per the need of customers. 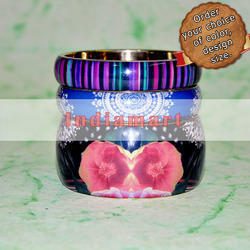 Our bangles are provided in quality packaging so as to maintain its defect free range at customer’s end. 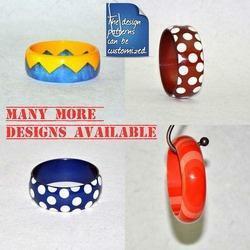 We hold expertise in offering a quality assured array of Handmade Resin Bangles. 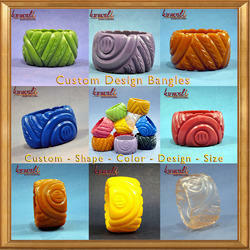 The Handmade Resin Bangles we offer is recommended amongst the clients for their unique appearance and different designs. 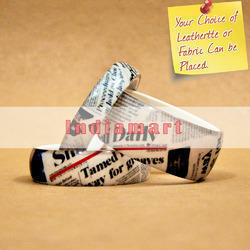 These products are made by using supreme quality material. 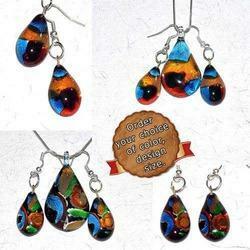 We have gained expertise in offering a quality assured array of Pendant Earrings. The Pendant Earrings we offer are designed under the skilled expertise of our professionals, as they have advance knowledge of latest fashion trend of the industry. Packaging Details: Bubble and Paper Wrapped. Made from high quality Acrylic | Resin and these are indeed world class. 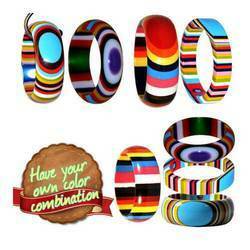 The colors used are non - toxic and a certificate of the same can be provided to you. 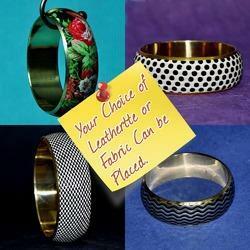 We offer Bracelets | Bangles and other jewelry variety of various Shapes, Size along with Hand Painted, wooden combination, Paper Insert, Fabric Insert, Digital printed jewelry products. We undertake OEM and Customization | Custom Designing Order and make products to suit your requirements and acceptance to your targeted customers. Please feel free to get in touch with us for your designs, style & fashion with your own choice of colors. 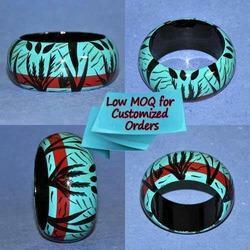 Our Speciality is execute custom order of Acrylic | Resin | Lucite Jewelry. 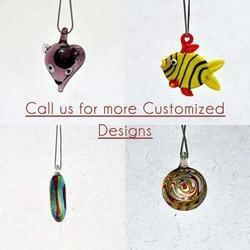 Owing to our expertise, we are offering a classy range of Glass Jewellery Pendants. Our offered pendant is designed by our skilled artisans using optimum quality material as per the market trends. The given pendant is renowned for its smooth finish and stunning shine. This pendant is made available in various designs and finishes in accordance with the clients' requirements. 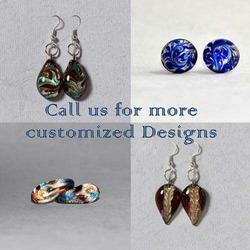 The most astonishing array of Artificial Earrings is offered to our clients. Embellished beautifully these products using stones and beads these products are available in different sizes and designs. Besides, one can get a quality tested array that too at leading prices. 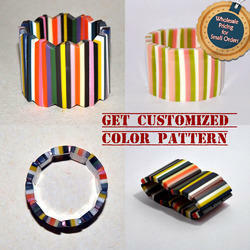 A wide assortment of Handmade Bracelets is offered to our clients. 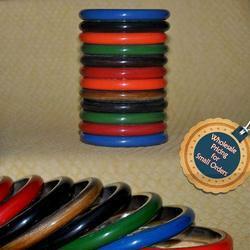 The Handmade Bracelets we offer are available in various sizes and known for their fine sheen. These products are designed accordingly as per the latest fashion trend of the industry. 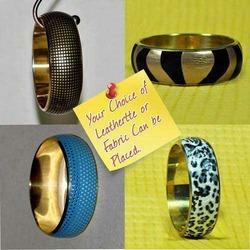 Designer Bangles offered by us is known for their designer appearance and unique looks. These products are available in various sizes that fit perfectly to the wearer. Moreover, generic and customized array of Designer angles are also offered from our end. 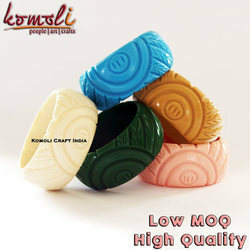 Komoli Craft India proudly presents endless variety & designs of Acrylic, Resin, Lucite Bangle, Bracelets, Cuffs, Earrings, Rings, Jewelry making beads etc of various sizes and patterns. These exotic handmade jewelry are perfect blend of Indian Pricing & International Standard of Quality and Services to our customers. We export these products to our patrons in United States of America, European Countries and Australia. 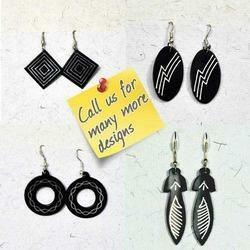 The most astonishing array of Artificial Earrings is offered to our clients. 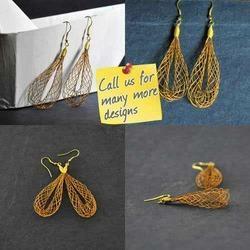 Embellished beautifully with brass wire these products are available in different sizes and designs. 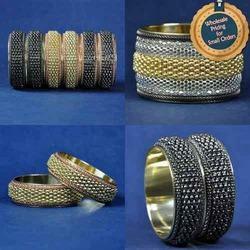 We are a reputed manufacturer, trader and supplier of superior quality Handmade Brass Chain Bangles. 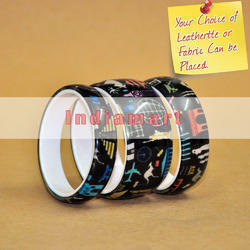 Best suited with any dress, these products are acclaimed in the market for their trendy look. We design these products from top grade brass by employing latest techniques. Our offered products are available from us in quality packaging for providing defect free range in a given time. 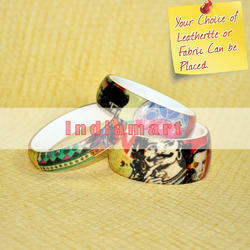 Fabric Lamination Bangle, Resin Laminated Bangles. Looking for Handmade Jewellery ?